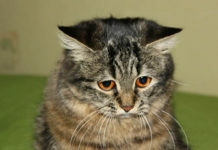 Face it – some cats are definitely easier to own than others, and the cats shown below obviously take the cake! A few of these are absolutely cringe-worthy, while others will simply make you smile. If you own jerk cats of your very own, you’ll definitely be able to relate. Trying to Get Healthy? Jerk Cats Say NOPE. This owner clearly loves her cat, hence the cat tree in the background – but does kitty care? It doesn’t seem like it! 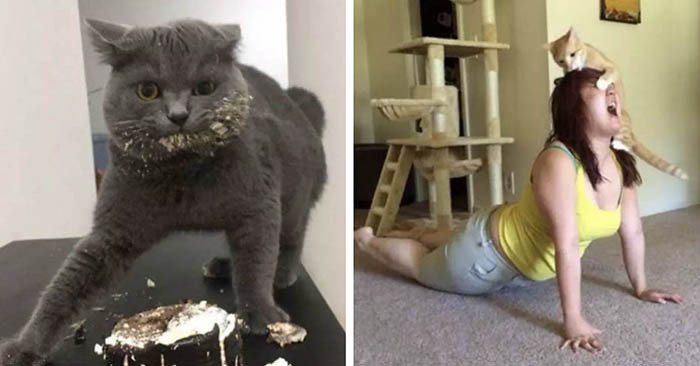 His owner is just trying to get her yoga on, but this jerk cat clearly has other plans. Or maybe he’s just concerned that she might be hurting herself and he’s trying to help. Yeah, let’s go with that. This owner’s jerk cat needed to prevent her kitty from going upstairs and causing chaos, so she had to take things to the extreme. 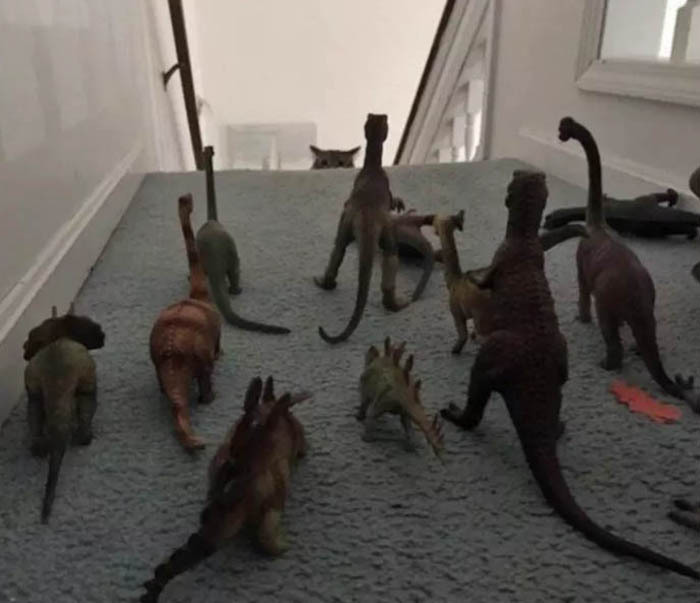 She placed an army of dinosaurs at the top of her stairs to deter kitty from entering, and it seems to be working! Note to self: Try placing plastic dinosaurs on kitchen counter. First of all, OMG what a cutie this kitty is! 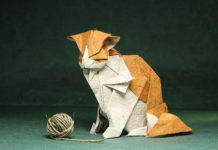 Probably a good thing, too – since he’s obviously a troublemaker and that cuteness might come in handy when his owner gets especially frustrated with him. 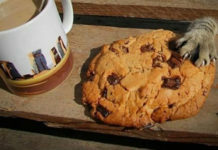 But man, can you blame him for wanting to try a taste of this utter deliciousness? 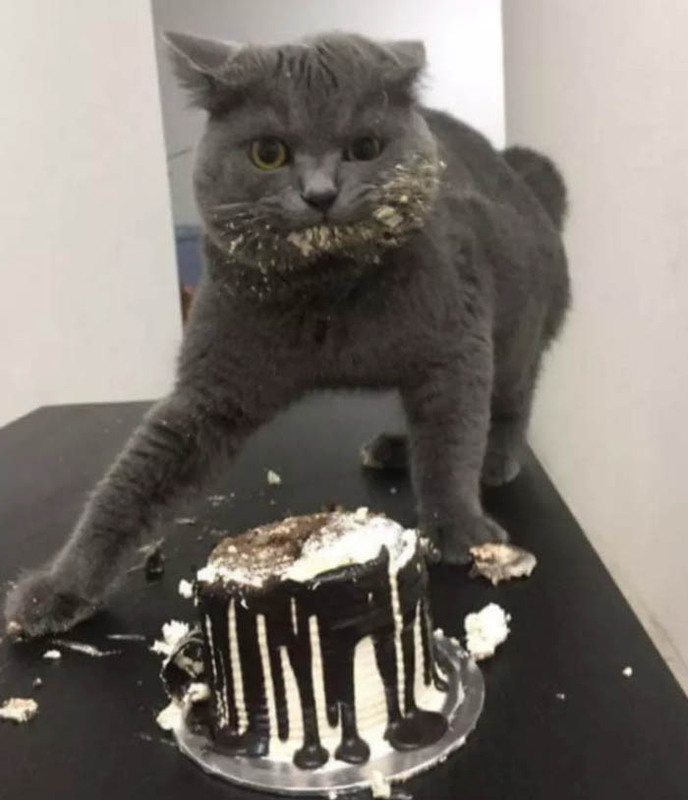 I’m sure this jerk cat thinks the cake looks so much better now that he’s helped re-decorate it, and you know… made sure it was safe for both human AND kitty consumption. Next articleA Case of the Mondays, as told by a Pallas’s Cat.